Solar power is produced from the sun with zero carbon emissions. Let’s face it, the sun has been producing energy for billions of years. Here is the history of its use by humanity. 3 How can we use solar power? 4 How many solar modules do I need? Solar technologies are broadly characterized as either passive solar or active solar depending on the way they capture, convert and distribute sunlight. 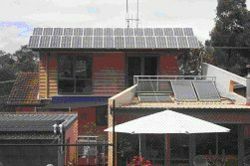 Active solar techniques include the use of photovoltaic panels, solar thermal collectors, with electrical or mechanical equipment, to convert sunlight into useful outputs. Passive solar techniques include orienting a building to the Sun, selecting materials with favorable thermal mass or light dispersing properties, and designing spaces that naturally circulate air. Solucar PS10 is the first solar thermal power plant based on tower in the world that generate electricity in a commercial way.The sun's heat and light provide an abundant source of energy that can be harnessed in many ways. There are a variety of technologies that have been developed to take advantage of solar energy. These include concentrating solar power systems, passive solar heating and daylighting, photovoltaic systems, solar hot water, and solar process heat and space heating and cooling. 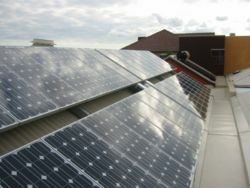 Solar power is used in large and small scale applications and systems for homes. Even the private sector (businesses and industry) are diversifying their energy sources, improving efficiency, and saving money by choosing solar technologies. Homeowners can also use solar technologies for heating and cooling and water heating, and may even be able to produce enough electricity to operate "off-grid" or to sell the extra electricity to the utilities, depending on local programs. The use of passive solar heating and daylighting design strategies can help both homes and commercial buildings operate more efficiently and make them more pleasant and comfortable places in which to live and work. Beyond these localized uses of solar power, utilities and power plants are also taking advantage of the sun's abundant energy resource and offering the benefits to their customers. Concentrating solar power systems allow power plants to produce electricity from the sun on a larger scale, which in turn allows consumers to take advantage of solar power without making the investment in personal solar technology systems. Solar power technologies, from individual home systems to large-scale concentrating solar power systems, have the potential to help meet growing energy needs and provide diversity and reliability in energy supplies. The need to address ‘climate change’ NOW is an opportunity to change direction and embrace a truly sustainable path. Electricity produced from the sun emits no greenhouse gases. The sun is the only perpetually renewable source of energy which the planet possesses and should be around for another 4 billion years. Solar power plants could power Australia Some of the largest investors and power companies in the USA have realised that solar thermal power is a probable replacement for coal, nuclear and oil - Professor David Mills, a world leader in solar research states. Professor Mills has left Australia for California, which has the target of 33% renewable energy by 2020. Australia’s renewable energy target is 2.5% by 2010. How can we use solar power? We do not have to wait for solar power stations. We can install our own solar modules, which convert sunlight directly into electricity. A solar array cleanly produces electricity when the sun is shining and any surplus electricity can be exported to the grid. At night, when the sun does not shine, electricity is imported back from the grid. An alternative arrangement is the installation of batteries, which store the electricity generated during the day for use at night. To use solar electricity which is generated as direct current (DC), we convert the DC to alternating current (AC). The device which converts DC into AC is known as an inverter and is easily installed. The power from the solar module is proportional to the amount of light shining on it. 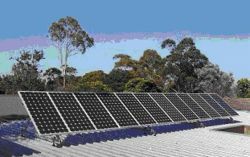 The key requirement for a suitable solar site in Australia is a north facing roof or ground space that is not shaded during the day. Solar modules, often referred to as PV (photovoltaic) panels, have no moving parts so there is nothing to wear out. It is estimated that they should last for 50 years or more. Solar modules can withstand a wide range of climatic conditions, including snow, frost, hail and high temperature. How many solar modules do I need? Consult your latest electricity account for your average energy use over the last 12 months. It is then a simple calculation to work out the number of solar modules required to meet your particular energy needs. 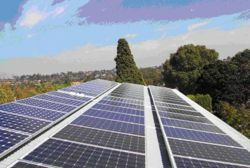 Personal experience over a full year of use of a typical 1kW (6 x 175W polycrystalline panels - 1050 notional watts) installed system in suburban Melbourne has shown that 4.20 kWh per day is a more likely outcome. This produces a figure of 13.61 (14 installed panels). When you install solar panels you create renewable energy certificates (RECS). You can keep the RECs for your panels as an investment and trade them when a carbon trading market is eventually established. They are increasing in value; the price as at March 2008 is $44 per REC. If however, you assign your RECs to a power company (that is perhaps subsidising the installation of the panels) then they get carbon credits for them, which will reduce the amount of greenpower they purchase from other sources. Essentially RECs are used by companies to offset their carbon emissions rather than reduce or eliminate them. If you elect to also purchase greenpower, then you pay an additional premium for power. If you have solar panels it may be better to lobby for an increased feed in tariff rather than purchase greenpower. An increasing number of countries have introduced legislation to paying producers of green power (e.g. from solar panels) a feed in tariff which ensures you are paid a premium price (up to 3 to 4 times the retail rate) for your green power. Legislation for feed in tariffs is about to be enacted in South Australia and Queensland in March 2008. Solar energy companies are relatively new on the scene and often have poor processes and high staff turnover. Understand the installation and end to end process so that you can get in touch with them when things are taking too long. Try and get a direct number if you can. Get advice from the installation company regarding placement and size and mock up how they will look on your house - take a photo and photoshop the cells onto the roof. Show your wife/partner. This may save you 10 tonnes of grief. They are all different and all seek to confuse charges to make comparison difficult. Some companies force you onto a different plan just because you have solar cells. This spreadsheet was up to date at time of writing and is an excellent comparison. With the generous rebates its definitely a worthwhile investment - but the joy I get from checking the meter every now and then and seeing that I'm generating stacks of free power is gold. Booklet: Electricity from the Sun, Solar PV systems explained. This page was last modified 02:37, 4 August 2015. This page has been accessed 128,809 times.